Choose from an array of classic bridal jewelry from Palm D'oro Jewelers. Look through the pieces we have to offer, or create your own with our designers. make the piece a reality. Look your best with chic custom designed jewelry from Palm D'oro Jewelers in Miami, Florida. Our team has 25 years of experience in the jewelry field. At our full service jewelry store, we offer custom designs as well as repair and watch services, which includes battery changes and more. For over 15 years, we have been providing excellent service, quality and value to our customers with their purchases, giving them the opportunity to buy directly from the source. The unique designs we offer are 30% to 50% lower than the best jewelers, while still maintaining the same or superior quality. At Palm D'Oro, you are dealing directly with the source. 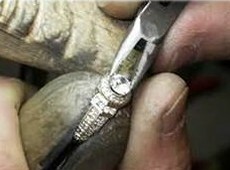 We are manufacturers and importers of gold and diamonds, and we work directly with diamond cutters. Our team of expert designers will help you design your dream piece of jewelry or the perfect engagement ring. Our designers will provide you with all the information that will empower you to purchase a quality piece for less. *We offer a seven day merchandise exchange return policy. Our mission: We provide and surpass great service, quality and value to our customers and all customer purchases. We maintain and place all of our efforts in offering and continuing quality customer service and professional care.